The Campanile is the famous bell tower of the world famous Florence Cathedral in Tuscany (Italy). Many visitors to the city climb the tower to enjoy the view of the cathedral and the city of Florence from above. Even more famous is the ascent to the dome of the cathedral next door. The Campanile is, as often in Italy, a detached bell tower. The church tower stands a few metres away next to the church. The tower has a height of about 85 meters. 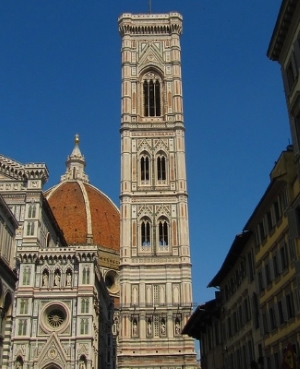 The cathedral of Florence might belong to the few churches where the church itself is higher than the church tower. The cathedral of Florence is especially famous for the gigantic dome on the church. At 107 metres, it is clearly higher than the bell tower. Both can be climbed as a tourist. The ascent of the dome is certainly the highlight, but the queues at the Campanile are usually a little shorter. The view from above to the city is grandiose for both of them. At the top of the cathedral tower, you can also photograph the neighbouring dome at almost the same height. By the way, the queue at the Uffizi Art Museum is often similarly long. Also for the famous museum you can buy a ticket in advance on the same website Getyourguide. You pay for the ascent of the steeple entrance fee. As far as we know, there is only one combination ticket, which costs about 18 Euro per person at the beginning of 2019. 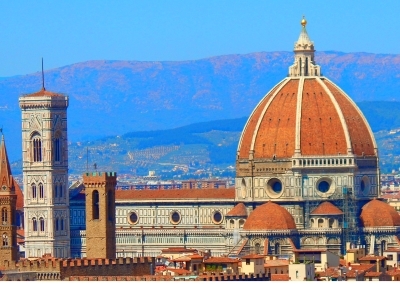 With it you can visit the church including the museum, the church tower and the world famous dome as well as the cathedral museum behind the cathedral Florence. Campanile means simply bell tower, „campana“ is the Italian word for bell. On the picture you can see that the white bell tower (left) is clearly lower than the dome. The construction of the bell tower of Florence Cathedral began in 1334 and was completed in 1359. An absolute attraction is the beautiful marble façade in three colours (white, green and pink). It became the model for the façade of the entire Cathedral, which has a similar façade on the outside. At the Campanile you can see some beautiful figures. Some of them are not original but copies. About 50 years ago, some valuable works of art at the bell tower were brought to the nearby church museum Florence for safety reasons. The ascent to the 85 metre high church tower of the Florence Cathedral is particularly scary in hot weather, but very interesting. A little more than 400 steps have to be climbed. Even more spectacular is the passage to the higher dome of the cathedral. As you have to buy an entrance ticket for all sightseeings of the cathedral, it makes sense to climb both buildings. You don’t have to climb the 400 steps all at once. There are several intermediate platforms on which you can rest and enjoy the view of the surroundings (panoramic view). The first platform is after about 150 steps, after 60 to 70 further stairs another viewing platform follows. From here you can see the cathedral, which is only a few meters away. 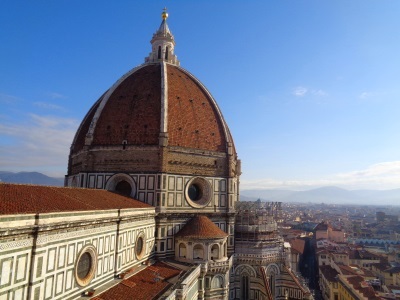 It is also an ideal point to look at the world-famous dome of Florence from close up (see picture). Moreover, you see the cathedral place below very well. On the platforms on the way up there are information boards on topics such as construction, architecture or decorative elements of the cathedral tower. These are bilingual in Italian and English. The corridor with the stairs to the bell tower of Florence Cathedral is somewhat narrow. When it was built hundreds of years ago, nobody thought that Florence would be overrun by millions of tourists a year. There is only one stairway, so there is always oncoming traffic. In some places it is so narrow that it is difficult to pass each other, but somehow it is always possible. But it is a big advantage not to come at rush hours, better you arrive early in the morning. During our visit in autumn 2018 the opening hours were every day from 8:15. The best view of Florence and its surroundings is of course from the very top. You also see the hills of Tuscany with villas and so on. In the short film below (length 1 min) you get an impression of the view. The cathedral museum is the central ticket office for all tickets to the cathedral. It is about 100 metres from the bell tower. You simply walk around the cathedral, the museum is about on the other side. There are the opening hours for all sights around the cathedral for the next 7 days. The bell tower is usually open from 8:15 to 19:20, at least this was the case during our last visit to Florence in 2018. On the ground floor of the Campanile (cathedral tower) there is a ticket office where you can buy tickets for the cathedral and so on. The entrance fee is 15 Euro, there is only one ticket for the cathedral, the dome, the cathedral museum, the baptistery and the bell tower. There is no single ticket for the bell tower. You buy the ticket better in the cathedral museum, there is the central cash with a lot of information as prices and opening times of the individual sights of the cathedral Santa Maria del Fiore (cathedral of Florence). Many sculptures and other works of art from the bell tower are no longer on or in the tower itself, but were used in the museum of the cathedral Florence. In the great museum, which costs almost 50 million euros and is about 100 metres away, there is a large room with many things from the Campanile. You should also take a closer look at the church tower from the outside. The marble facade is in three colours (white, green and red) and is beautiful. The bell tower is about 3 meters from the cathedral (detached church tower, typical of Tuscany and Italy). The passage between the tower and the church is not possible (lattice).